This private tour of the excavations of Herculaneum and the National Archaeological Museum of Naples was created by our team of experts to offer the visitors a unique and unforgettable experience to discover two of the most prestigious archaeological sites in the Campania region. Furthermore, to lead this day of discovery you will have a private REAL ARCHAEOLOGIST, just for you, a scholar of the ancient civilizations that inhabited this region in ancient times. The ruins of Herculaneum need no introduction: this ancient city was buried by the infamous eruption of Mount Vesuvius in 79 AD and it shares this sad fate with the nearby cities of Pompeii and Stabia. During the excavations that interested the area of Herculaneum, all the ruins came out from the womb of the earth almost intact: buildings, walls, columns, statues, bronzes etc. that appear as returned to life. The prodigious conservation of houses and wooden furnishings make this Roman city an incomparable archaeological wonder. To make this day unforgettable, we think that there would be no better way than to visit in company of the Archaeologist also the Archaeological Museum of Naples (MANN) that keeps not only many of the finds discovered in the excavations of Herculaneum and Pompeii, but also other incredible testimonies of ancient civilizations coming from all over the world. 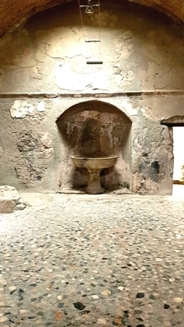 Here at MANN you will have the opportunity to admire the original artifacts (like statues, frescoes, mosaics) from the buildings of Herculaneum that for reasons of safety and conservation cannot be displayed in situ (in their original place). This is a walking tour (NO transportation is included) and the transfer between the two sites will be by EAV Circumvesuviana railway trains (this trip between Herculaneum and Naples takes about 35-40 minutes). Quick lunch break if required. (Entrance tickets and train tickets are NOT included). You’ll meet our professional English-speaking guide – a real Archaeologist - by a pre-arranged meeting point by main entrance of Herculaneum site. Of course this tour can be customized to your needs and requests and, if you prefer, we can start it from the National Archaeological Museum of Naples instead of Herculaneum. You’ll spend 2 hours in each site (+ transfer time by train) together with our professional English-speaking REAL Archaeologist and you’ll see some of the most important houses and buildings in Herculaneum plus the most important collections at MANN. Do not miss this chance to visit these amazing sites together with a qualified scholar, a REAL ARCHAEOLOGIST. While a licensed English-speaking guide will be able to provide the basic facts about these ancients towns and its inhabitants, only with an English-speaking REAL ARCHAEOLOGIST who has dedicated his life as a scholar to this field of study, you'll really understand the habits and the real life of these ancient Roman civilizations. We can assure you that this will be the added value of your trip! THIS PRIVATE TOUR (WITH A REAL ARCHAEOLOGIST) IN HERCULANEUM RUINS & MANN MUSEUM OF NAPLES COSTS EUROS 400. THE ENTRANCE FEE IS NOT INCLUDED.